Notice that one of Stampin' Up! 's Spider Web Doilies (page 47 of the Holiday Catalog) was used in the card. I learned recently (thanks, Patrice!) that, if you are going to cover up the center of the doily, why waste it? Take a couple minutes to carefully snip that center of the doily away to use in a future project! In the next week or two, I will share the card the girls made utilizing the center of the web. Stay tuned! To further add to the card's sinister look, I tore a page from an old yellowed book and incorporated that into the composition. For the sentiment, I used a little strip of the same book page without the print and tore it to the proper shape and size. You can also notice that I used some of the retired Halloween Washi Tape that I had purchased from the Stampin' Up! Clearance Rack. I love the look of the rows of skulls. At my workshop, in case any of the girls weren't crazy about the skulls, I offered another -- not-quite-as-spooky -- option in black and white. 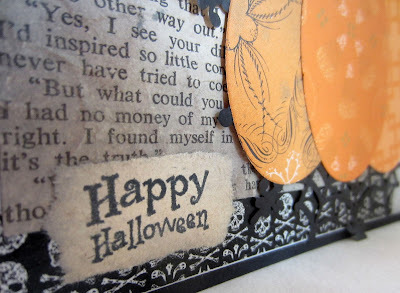 I like the looks of the card because it could also be used simply as a seasonal decoration! Spoooooky! Following are the supplies and directions to recreate (resurrect?) this card for yourself. Use the Simply Scored tool to score a 4 1/4" x 11" piece of cardstock in half, at 5 1/2". Fold on the score line. Sponge the edges of a 4" x 5 1/4" piece of Smoky Slate cardstock with ink to match. Adhere this piece to the card base. 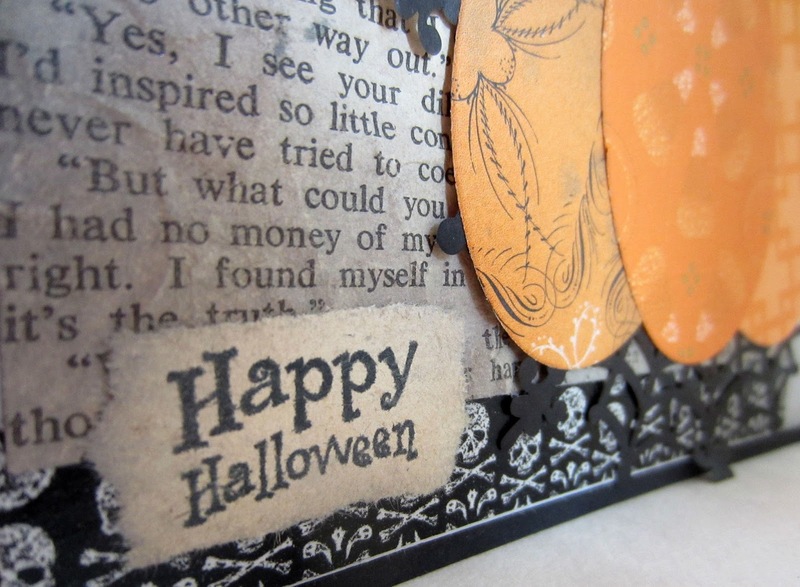 Add 4 1/4" pieces of spooky Washi tape to the top and bottom of the gray piece. 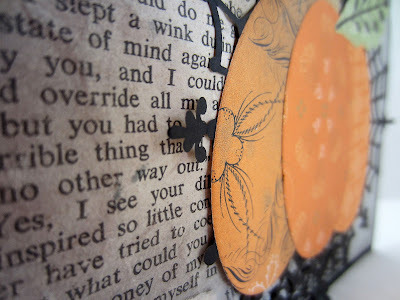 From an old throw-away book, take a piece of a page that measures 3" x 4 1/4" and crumple it loosely in your hands. Flattening it out somewhat, sponge over the words with Smoky Slate Ink. Adhere this between the Washi Tape pieces. Depending on the width of your Washi Tape, there may be some overlap. From a scrap of the book page (without print), stamp the sentiment in black ink. Add a little sponging to this piece. Tear it to size and adhere it to the lower left of the card. 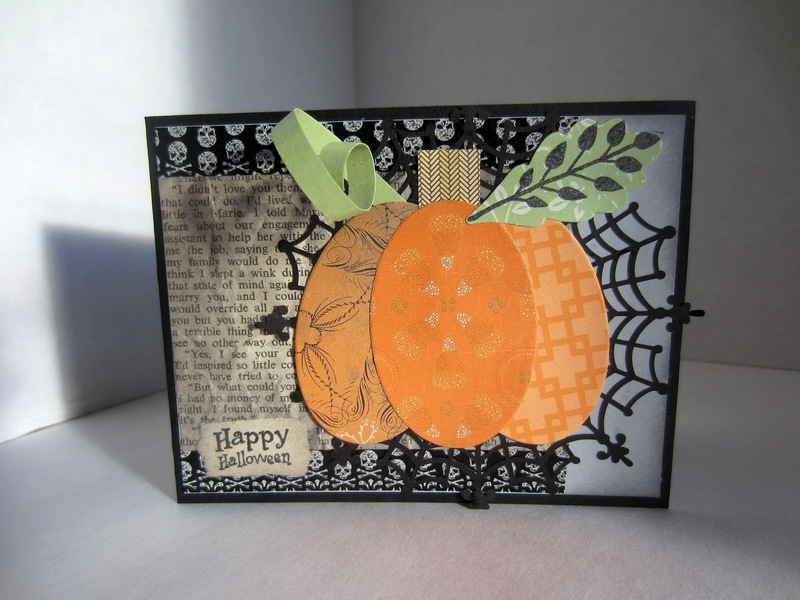 Using tiny drops of glue (or the Fine Tip Glue Pen on page 43 of the Holiday Catalog), adhere the spider web to the card, with just a bit hanging over the right, top and bottom edges. To create the pumpkin, cut three ovals, using the Framelit that yields 1 3/4" x 2 5/8" ovals, from each of the three different orange Designer Series Papers. Slant the bottom two ovals toward each other, with their tops touching. Add the top oval over these, gluing it all in place. Stamp in black the feathery leaf onto a piece of the green DSP that you've chosen. Cut it out with the appropriate Framelit. 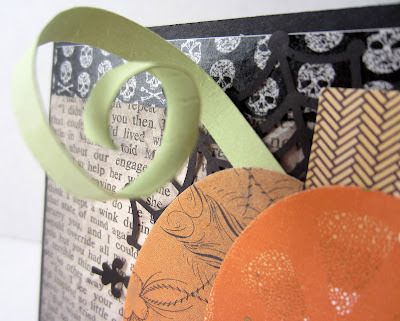 Create the stem for the pumpkin with the Banner Punch and the brown DSP. Adhere the leaf and the stem to the pumpkin top. Hide the pointed ends of the banner piece behind the pumpkin. Wrap a strip of matching green cardstock that measures 1/4" x 6" tightly around a pencil, pulling it off gently to retain a curl. Attach to the back of the pumpkin. Adhere the pumpkin over the web, with a bit more of the web showing to the right of the pumpkin. Love it! The book page was a great touch! That is so cute. At least I can try this on my own. Can't wait to see what you do with the rest of the spider webs. These are SO cute. I'm not real good with paper crafts, but this is so adorable I want to try it. Wow you have created the cutes card. Thanks for sharing this with us at Cooking and Crafting with J&J. OMG this is adorbs! So love this!! So adorable, and pefect for Halloween. So pretty and cute!! Would make an awesome sign or card. Just love your cards! Thanks for sharing at #OMHGWW. Oh goodness this is so cute!! thanks for sharing on the #OMHGFF hope to see you next week! What a cute card!! Thanks for sharing on My 2 favorite Things on Thursday - link Party! Hope to see you again this week! Pinned!